The recipe I have for you today is, as promised in my last post, delicious Weeknight Curry from Heidi's Swanson cookbook Super Natural Every Day. 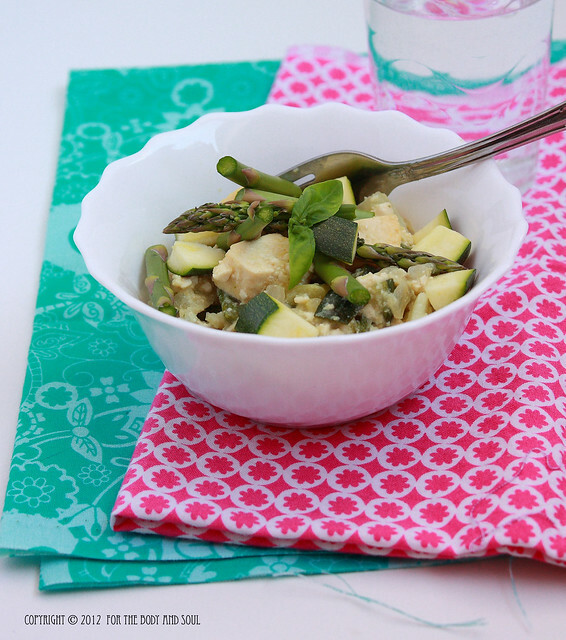 Although I prefer to call it Springtime Curry as it's full of crunchy seasonal veggies. Like all Heidi recipes, the curry is not only very tasty but also super healthy. It's a straightforward recipe that takes just a few minutes to prepare. 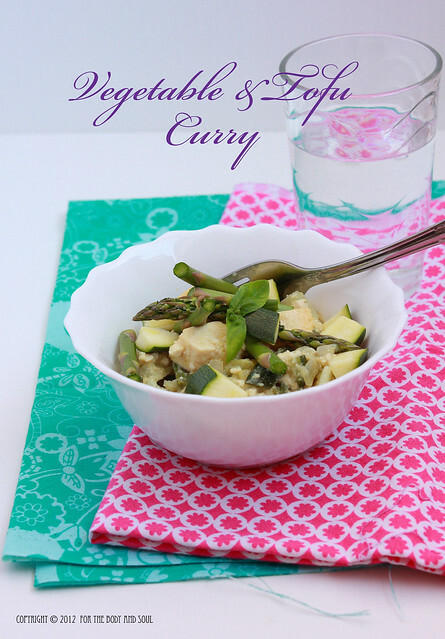 I made my curry- the same as Heidi did- with cauliflower, zucchini, and asparagus, but you can use any veggies you have on hand. Heidi recommends another version of the recipe with peas, broccoli, and tiny cooked potatoes. You will need Thai curry paste for your recipe, the original called for red one, but I used green in its place. This is a very flexible recipe, so feel free to experiment. If you don't like tofu, you can leave it out, and serve your curry, for example with rice. Chop the onion. Cut the zucchini into ½ -inch pieces. Chop the cauliflower. Trim and cut asparagus into 1 inch pieces. Cut the tofu into ½ inch cubes. Heat the coconut oil or clarified butter in a large pot over medium heat. Stir in the onion and a big pinch of salt. Sauté until the onion starts to become translucent. Sir in the zucchini and cook for 1 minute more. In a small bowl, mash the curry paste with a few tablespoons of coconut milk. Add this to the onion and zucchini. Stir until the vegetables are well coated. Stir in the remaining coconut milk. 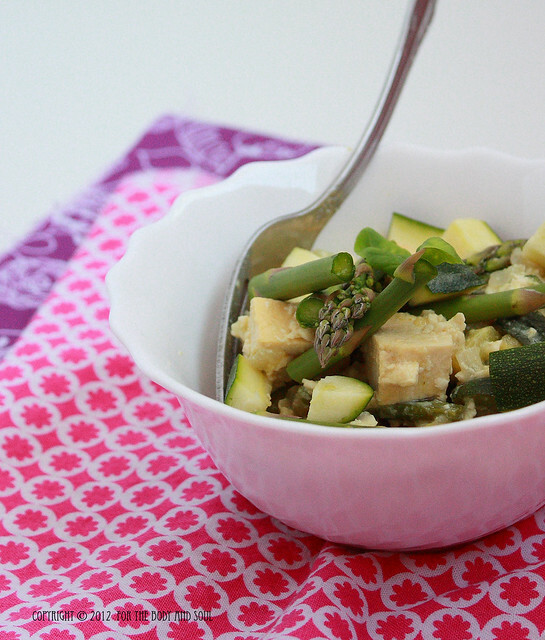 Bring it to a simmer; add the tofu, cauliflower, and asparagus. Cook for a couple of minutes- the veggies should remain crunchy, but not raw. Pour in the broth. Stir than salt generously (you will need less salt if your broth was already salty).